Storm, Barry. Gold of the Superstitions. 1940. Intended as the first in a series of publications that never materialized. Storm tells the story again he told much better in the first eight chapters of Trail of the Lost Dutchman: the story of the Peraltas, the Apaches, Ludi and Jacobs, Walz(sic) and Weiser, and Adolph Ruth. Storm adds some new photographs, placing more emphasis on treasure signs and miner's symbols, and Weiser's map is fleshed out. In addition, several minor points in the story are changed. It remains much the same text as that in Trail of the Lost Dutchman, but there is something puzzling about the relationship of these two works. At first glance, Gold of the Superstitions seems merely a shortened version of Trail of the Lost Dutchman, no more. A more careful reading, however, reveals it is not an abridged or condensed edition at all. What Storm did was very odd, as though he chose to tell the exact same story again, but in different words. He kept many sentences, phrases, and paragraphs intact, but inexplicably rewrote others. There is no apparent logic to it, the rewriting does not effect the meaning, just captures it in different words. 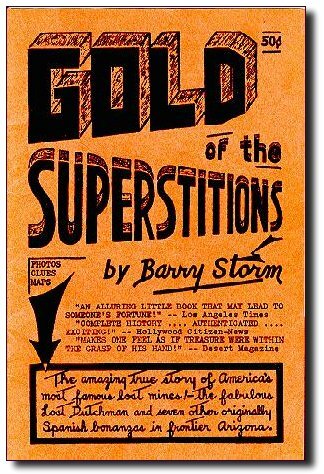 Gold of the Superstitions appears to be written by a less polished author than the one who wrote Trail of the Lost Dutchman. Which is the real Barry Storm? Unfortunately, the works Storm wrote over the next twenty years provide ample evidence that the less polished author is the real Storm. As I note in the entry for Trail of the Lost Dutchman, Tom Kollenborn informed me that Storm received assistance with his first book. Ok, but this still leaves us with an interesting set of questions. If Storm did not really write Trail of the Lost Dutchman by himself, or at all, did Gold of the Superstitions turn out this way because Storm was now free of editorial assistance? 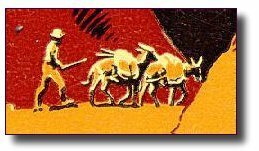 Or is it possible that Gold of the Superstitions was Storm's draft for what became those eight chapters in Trail of the Lost Dutchman - how they looked before some unacknowledged editor or silent co-author cleaned them up? Of course, looking at the progression of editions of Thunder Gods Gold over a twenty year period it is apparent Storm liked to fuss with things, making numerous changes both small and large - maybe that is what happened here. My guess, however, is that Storm used his original notes for this publication, and that this is very much what those eight chapters would have looked like if he had never had any help.